The Grand March for Life and Peace concluded last night with a rousing rally in Jeju City along the sea wall (that reminds one of the Malecón in Havana).As our east team met the west team in the center of the city each side carried one of two large banners depicting wooden totems that now stand in front of the peace center in Gangjeong village. The two banners were brought into the busy traffic clogged intersection and symbolically joined. From there the two merged teams walked the last few miles to the rally site. The totem banners were erected onto the large stage and as dark came, and the stage lights hit the banners, the beautiful colors came alive in a brilliant display. I was very moved to stand on that stage and deliver the message representing the international guests. As you can see in the short video above, taken of the west team during a storm, not even a down pour bothered the walkers. Very few pulled out umbrellas or raincoats – most just keep moving along to the music coming from the sound trucks. There is so much to say about this walk including the many things I learned and about the Korean people that we had the great fortune to meet during these days. I will likely write a series of posts, with many more photos, in the coming days as time and the words make themselves available to me. In the meantime I must say thank you to all our new friends and co-walkers for this incredible experience. Despite the fun and the excitement of the walk what must come first is the reminder that the people in South Korea are witnessing their democracy being dismantledeach day by the right-wing Park government. 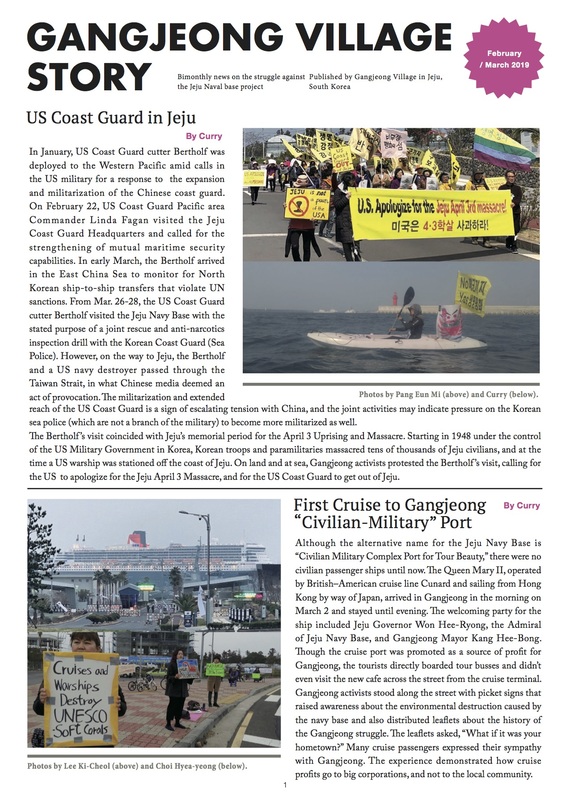 They are seeing their country, already long a US military colony, become even more so as Washington rushes to prepare for war with China and Russia. People here, like in Okinawa and Guam, know they are a prime target in a conflict because of the US bases on their islands. They are doing all they can NOW while they still can. They wonder why people in the US and in Europe are largely so silent and inactive when it comes to the massive expansion of the US-NATO war machine into the Asia-Pacific (including new NATO partnership agreements with South Korea, Japan, Australia and New Zealand). In my short talk last night I told the hundreds who were assembled at the final rally the story of our protest in Bath, Maine last June when 12 of us (Zumwalt 12) were arrested at the Bath Iron Works shipyard for blocking the road and gate into the ‘christening’ ceremony for a new warship. I said that warship was likely to visit Gangjeong village at some point. 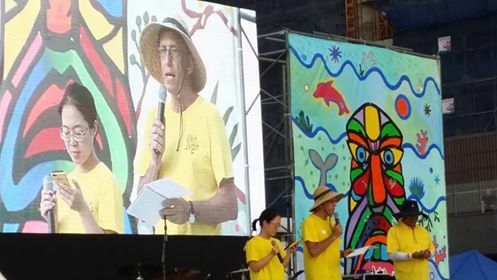 I told the people that they inspired us in Maine to act – in fact five of the 12 of us who were arrested have been to Gangjeong village over the past few years. I said we’d continue to support them into the future. The only way we can prevent WW III is to become bolder during this dangerous time of military expansion and the drowning of democracy. The people of Korea who have come to Jeju Island in large numbers (union members, human rights activists, peaceniks, parents of the Sewol ferry students killed in that terrible accident, Korea Green Party members, priests & nuns, environmentalists, and community leaders) are showing that it is possible to build effective coalitions in order to protect democracy, peace and our Mother Earth.